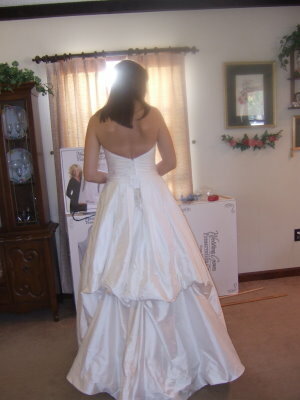 Note the ties that are sew under the dress to form the French style bustle. 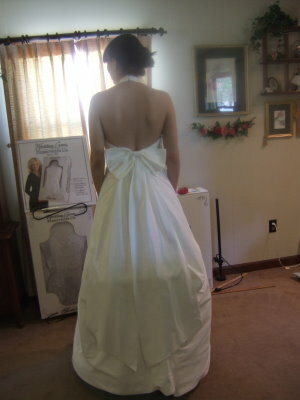 Your gown would have to be lifted up in order to tie it up. 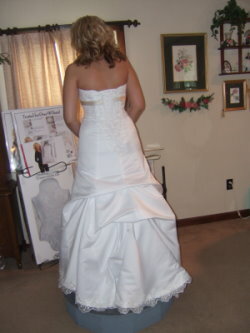 The French bustle also known as the "European" style bustle or the "under bustle" is a favorite among brides. 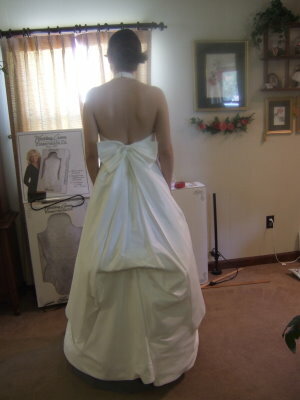 This wedding dress bustle style sticks out less than the American bustle, because once it is tied, it forms a flap. How is a French bustle formed? Usually you will see sets of ties made of ribbon or cotton stay tape. Sometimes you will see ties with corresponding loop sets to tie the train up. Unlike the American bustle, everything is done under the gown instead of outside of it. So to tie the bustle up, the train has to be lifted up in order to tie it. 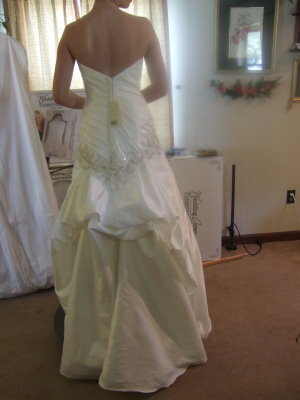 Since your train will have to be pulled up for this bustle style, you may want to have your bustle done out of the view of your guest. It may also be best to do this before going into your reception, so you don't have to excuse yourself from your reception to have your bustle done. 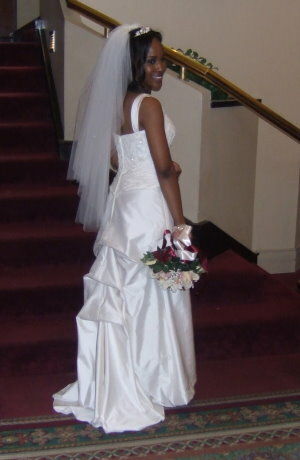 Now let's take a look at different wedding gown styles in various French bustle designs! 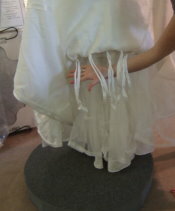 This is a 3 point bustle where the points were kept at the same level to make one flap. 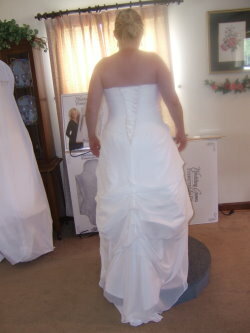 This one is a 4 point bustle with two points in the middle that forms two flaps. 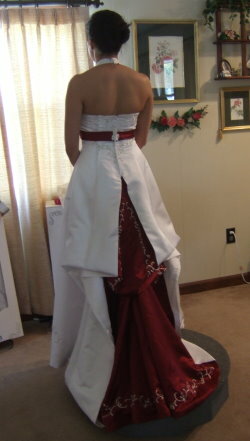 Here is another 2 tier bustle. 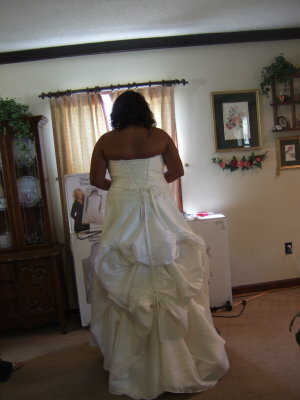 This gown is a "combo" of an under bustle and an over bustle. 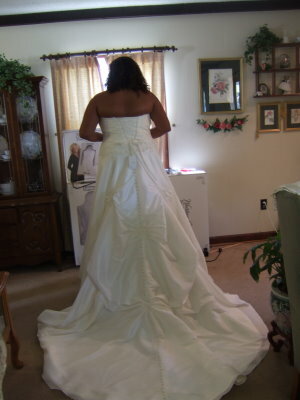 The wedding gown below had a very short train, but I was able to make a triple french bustle on it. Here is a short train that was bustled into a three tier European bustle. 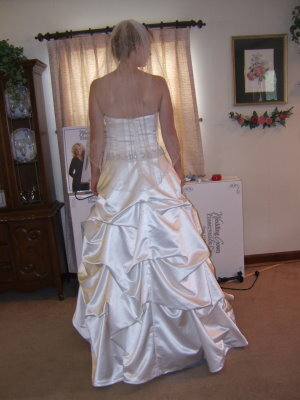 Wedding dresses that have the pickup style skirts can present a challenge to bustle. 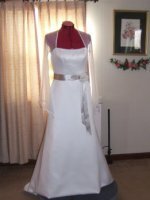 As a seamstress you want the bustle to work with the design of the dress. Sometimes an American bustle will work for this style. 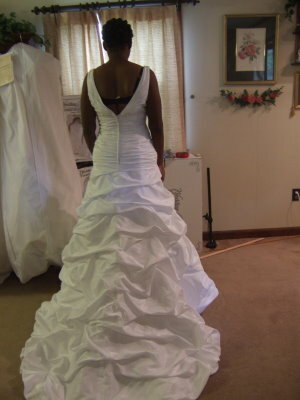 But most of the time the French wedding dress bustle is the best choice for the pick up skirt wedding dress. Take a look at a few. Under bustle before ties are placed over it. 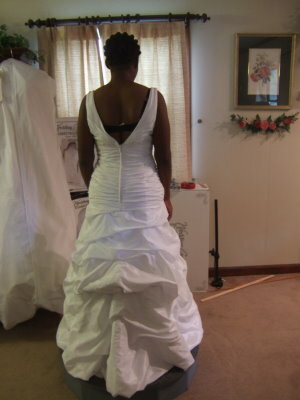 Here the ties are placed over the bustle. 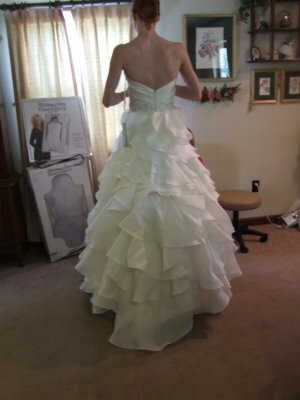 This is one of those multi tiered ruffled wedding dresses in the under bustle french style. Here is a layered look in a French bustle style. As you can see there are a variety of looks you can get from the french under bustle style. 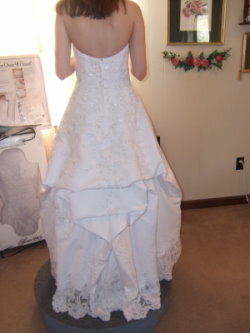 It should be designed to so that it works with the design of your dress. 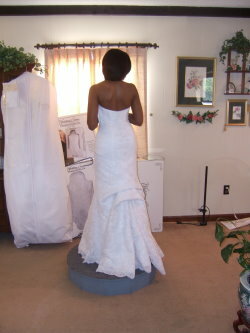 The wedding dress bustle adds another dimension to the wedding dress design. 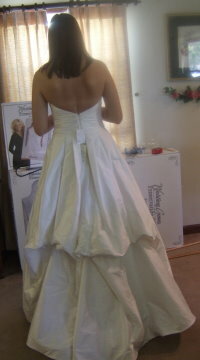 So make sure your alterations specialist gives you a look that will enhance the style of your dress.